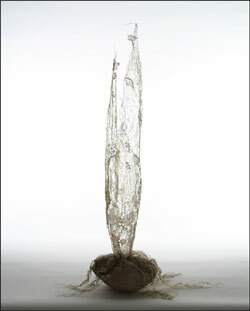 My recent work combines stitch, lace fragments and stones to create ethereal sculptural forms. Inspired by life forms clinging to rocks on the seashore, connections are made with the tenacity and fragility of human existence. Tension is created between the hard unyielding stone and the soft pliable textile forms. The work explores the contrasts between fragility and strength, and lightness and weight. The textile pieces are created by trapping silk fibres, lace fragments, yarns and text within a web of invisible monofilament thread and embroidery thread which are machine stitched onto soluble fabric. When this is washed away it reveals what appears to be a fragile web of stitch and fragments but which actually has an inner strength. The work investigates the space in which it exists and the interplay between form, light and shadow. I produce one-off textile art pieces for exhibiting and also work to commission. 2002-2006 B.A.(Hons.) Applied Art University of Hertfordshire. 2000-2002 B.T.E.C. Foundation Course in Art, University of Hertfordshire. 1970-1973 L.S.I.A.D and Diploma in Fashion Design, Preston Polytechnic. Specialising in textiles - screen printing, hand and machine stitching and embroidery. Zandra Rhodes Fashion and Textile Museum. Freelance work for fashion designer, Helen Storey. I.M. International (fashion consultancy) London, Head of Design. Dandelion Ltd. London, Head Fashion Designer. March 2008 East London Festival Catalogue. SDC Gallery 'New Beginnings'. Art Embroidery - Still Live 2007 Pfaff Art Embroidery Challenge catalogue for exhibition. The London Design Festival Catalogue, Sept 2007, 'Sewn Up' at The Zetter Hotel. March 2011 Art Week Workshop. Colnbrook School, Hertfordshire. 13th-14th Nov 2010 North Wales Embroiderers Guild. Ran workshops for group. 3rd- 5th Oct 2008 'Fashion Embroidery and Stitch', Harrogate. 20th Sept-2nd Nov 2008 'Autumn Glow' The Beetroot Tree Gallery, Derby. 22nd Jan - 29th Mar 2008 'New Beginnings' SDC Gallery, London. January 2008 'Designer Crafts 2008' Mall Galleries, London. Nov 2007 - Jan 2008 'Objects of Desire' Chapel Gallery, Ormskirk. October 2007 Designer Crafts @ Chelsea, Chelsea Town Hall, London. October 2007 Pfaff Art Embroidery Challenge 2007 exhibition 'Art Embroidery- Still Life' at the Knitting and Stitching Show, Alexandra Palace, London. September 2007 'Sewn Up' London Design Festival, Zetter Hotel, London. 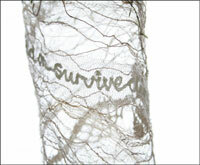 21st July- 9th Sept 2007 'Riches of Stitches', Bankfield Museum, Halifax. April-May 2007 'Fabric 2 Dye 4' Stroud House Gallery Stroud. March 2007 'Tactile' Otter Gallery, Chichester. January 2007 Designer Crafts 2007, Mall Galleries, London. 1st- 3rd December 2006 "Made in Clerkenwell", London. 27th-29th October 2006 N.A.M.E. Stoneleigh-Park Exhibition Centre, Warwickshire. 20th-22nd October 2006 Islington Contemporary Art and Design Fair, London. September - October 2006 Barnet Open, Artsdepot, North Finchley, London. July 2006 New Designers, Business Design Centre, London. June 2006 Degree Exhibition, University of Hertfordshire. May 2004 Courtyard Art Gallery, Hertford. June 2002 B.T.E.C. Foundation Exhibition, University of Hertfordshire. All works and images ©Linda Baker 2006-2012.